Michael Phelps — the Olympic gold-medal swimmer who jumped into hot water over a photo of him holding a bong — has returned to competition for the first time since the Beijing Olympics. Suspended for three months from organized competitive swimming after a photo of him holding a bong — a device commonly used to smoke marijuana — surfaced in February, Phelps dived back into the public eye at the Charlotte UltraSwim in North Carolina, a meet that runs from Thursday to Sunday. Speaking to reporters, Phelps reiterated what he said was his “bad judgment” and a “very stupid mistake.” He said he hopes he can persuade people “to never make the same mistake.” He also said he’s become more careful about where he goes and with whom he associates. 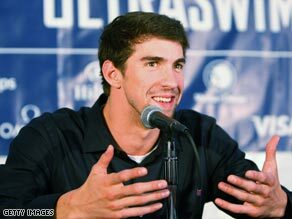 The winner of a record eight gold medals at the 2008 Olympic Games in Beijing, China, Phelps said he’s looking forward to being back in the competitive pool. “I have no idea how I’ll do,” he said, adding he’ll “just hop in the water and see what happens.” Watch Phelps say he’s glad to return to racing » He said he’s been training the last eight weeks, lost a lot of weight, and is excited about his upcoming competitions, including the Charlotte event and the meets leading to the 2012 Olympics in London, England. “The whole spectator section is all sold out already,” he said. He had admitted “regrettable behavior” before, just after the tabloid News of the World showed him with a bong during what it said was a November party at the University of South Carolina in Columbia. South Carolina authorities investigated Phelps and said he will not face criminal charges in connection with the party. “We had a photo, and we had him saying he was sorry for his inappropriate behavior,” Richland County Sheriff Leon Lott had said earlier this year. “That behavior could have been going to a party. … He never said, ‘I smoked marijuana.’ He never confessed to that. We didn’t have physical evidence. We didn’t have enough where we could go arrest him.” USA Swimming, the nation’s governing body for competitive swimming, suspended him for three months, withdrew financial support and barred him from competition during the period of his reprimand.